Recently, ProKnow’s own Ben Nelms worked on a project with Vladimir Feygelman, Ph.D. and other colleagues at Moffitt Cancer Center, with the goal to design analytical datasets and analysis methods to validate the accuracy of DVH algorithms. These algorithms, contrary to popular belief, are not all created equal, nor are they always rigorously validated by the manufacturers of treatment planning systems (TPS) and other applicable software. In June 2015, the Medical Physics journal accepted our work for publication, a paper entitled: “Methods, software and datasets to verify DVH calculations against analytical values: Twenty Years Late(r).” The article was published in volume 42(8) and can be found here. In addition to distributing our raw analytical DVH curves which serve as the standards against which to compare software-generated numerical DVH curves, we also created a simple yet powerful software application called “CurveCompare” designed to analyze the data and produce metrics and statistics. The software is for research purposes (i.e. not commercial) and frees the medical physicist from having to design his/her own Excel spreadsheets and/or custom code (e.g. MatLab). Using a single, specific app can help ensure consistency of the same analysis performed by many institutions. 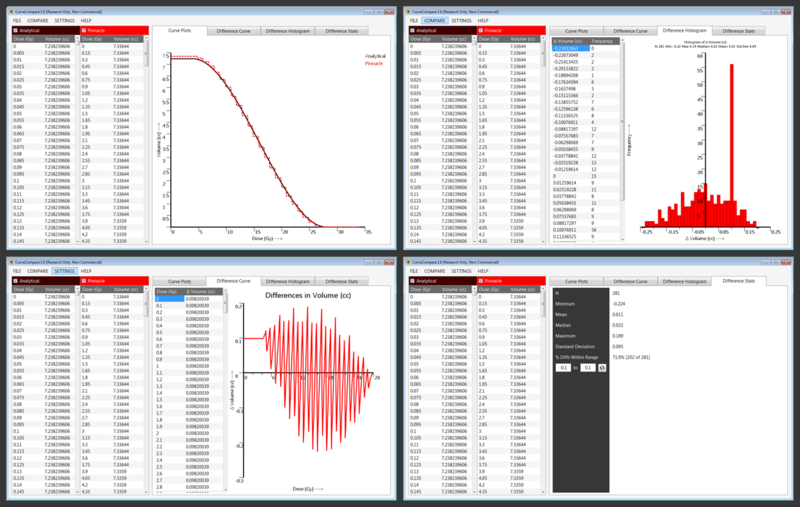 The software analyzes any two curves and is not limited to DVH data, and thus could be used to analyze other data sources such as dose profiles. The CurveCompare software will run on Windows (XP, 7, 8.x, 10) and requires the the .NET 4.5 Framework (or later), which is available free from Microsoft for users who do not have it installed already. Want to participate in ProKnow plan studies? Public plan studies are free to all that participate. If you’re not a registered member of the proKnow community, it’s easy to sign up and get started.